Free Shipping Included! 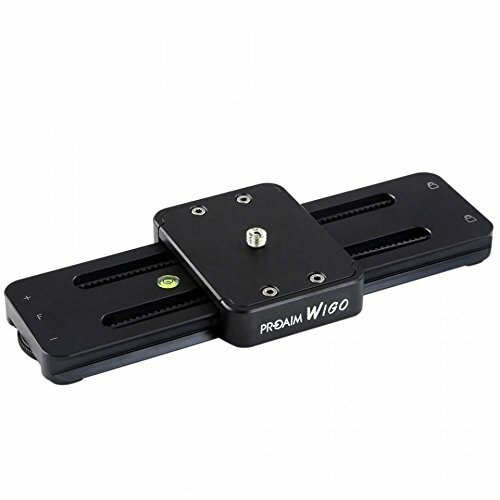 Proaim Wigo 9”/22cm Portable DSLR Camera Camcorder Slider with Load Capacity 10Kg/22lbs | Professional Track Dolly Rail Slider Tripod Compatible Video Stabilization System (SL-WG) by PROAIM at Nebula Fia. MPN: 4332066135. Hurry! Limited time offer. Offer valid only while supplies last. After completing the video footage, it takes a lot of time & effort of the video editor to cut out all the clutter to bring out the desired result. After completing the video footage, it takes a lot of time & effort of the video editor to cut out all the clutter to bring out the desired result. Wigo's 6" camera travel is enough to capture the most desired part of a sliding shot, saving your time & effort in post-production. - Total length: 9" - Camera travel : 6"
If you have any questions about this product by PROAIM, contact us by completing and submitting the form below. If you are looking for a specif part number, please include it with your message. COOCHEER Professional Video Tripod, Heavy Duty Tripod System with 360 Degree Fluid Drag Video Head, 1/4" and 3/8" QR Plate and Bubble Level, Max Loading 33lbs and Height 61"